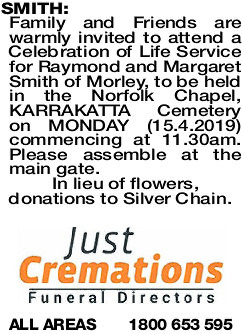 Family and Friends are warmly invited to attend a Celebration of Life Service for Raymond and Margaret Smith of Morley, to be held in the Norfolk Chapel, KARRAKATTA Cemetery on MONDAY (15.4.2019) commencing at 11.30am. Please assemble at the main gate. In lieu of flowers, donations to Silver Chain. 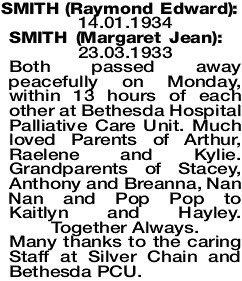 23.03.1933 Both passed away peacefully on Monday, within 13 hours of each other at Bethesda Hospital Palliative Care Unit. 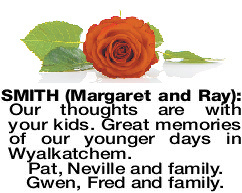 Much loved Parents of Arthur, Raelene and Kylie. Grandparents of Stacey, Anthony and Breanna, Nan Nan and Pop Pop to Kaitlyn and Hayley. Together Always. Many thanks to the caring Staff at Silver Chain and Bethesda PCU. 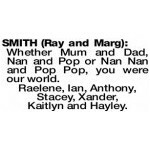 Whether Mum and Dad, Nan and Pop or Nan Nan and Pop Pop, you were our world. Raelene, Ian, Anthony, Stacey, Xander, Kaitlyn and Hayley. 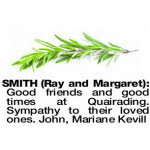 SMITH RAY AND MARG Passed away on Monday 8th April. 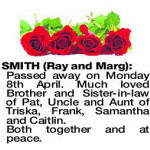 Much loved Brother and Sister-in-law of Pat, Uncle and Aunt of Triska, Frank, Samantha and Caitlin. Both together and at peace. 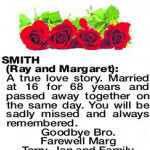 RAY AND MARGARET A true love story. 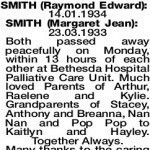 Married at 16 for 68 years and passed away together on the same day. You will be sadly missed and always remembered. 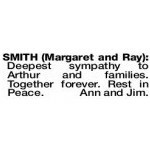 SMITH MARDI AND RAY Our hearts are broken by the passing of two special people. 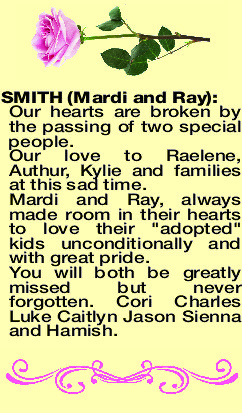 Our love to Raelene, Authur, Kylie and families at this sad time. 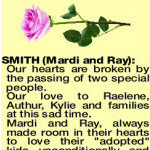 Mardi and Ray, always made room in their hearts to love their "adopted" kids unconditionally and with great pride. 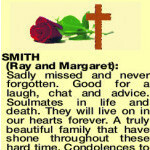 You will both be greatly missed but never forgotten. Cori Charles Luke Caitlyn Jason Sienna and Hamish. Together forever. 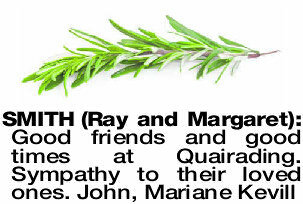 Deepest sympathy to Arthur, Rayleen, Kylie and all families. 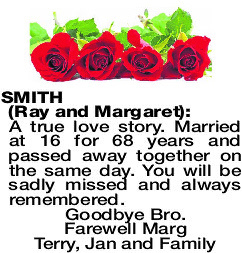 Miss you both always. Love Bob, Larraine and family. Our thoughts are with your kids. 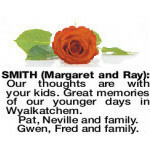 Great memories of our younger days in Wyalkatchem. Pat, Neville and family. Gwen, Fred and family. Deepest sympathy to Arthur and families. Together forever. Rest in Peace. Ann and Jim. Dear Friends and former neighbours over many years. 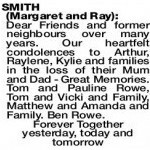 Our heartfelt condolences to Arthur, Raylene, Kylie and families in the loss of their Mum and Dad - Great Memories. Tom and Pauline Rowe, Tom and Vicki and Family, Matthew and Amanda and Family. Ben Rowe. 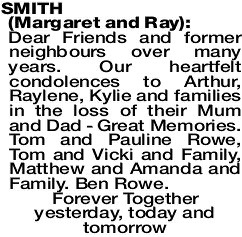 Deepest sympathy to the families on the sad passing of your mum and dad. May they rest in peace. 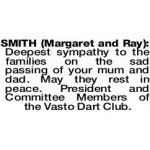 President and Committee Members of the Vasto Dart Club. 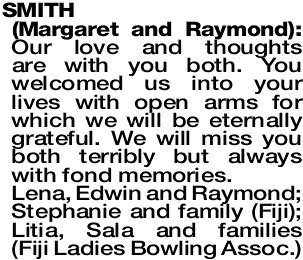 Our love and thoughts are with you both. You welcomed us into your lives with open arms for which we will be eternally grateful. 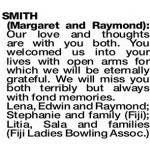 We will miss you both terribly but always with fond memories. 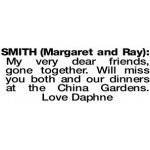 RAY AND MARGARET Sadly missed and never forgotten. Good for a laugh, chat and advice. Soulmates in life and death. They will live on in our hearts forever. A truly beautiful family that have shone throughout these hard time. 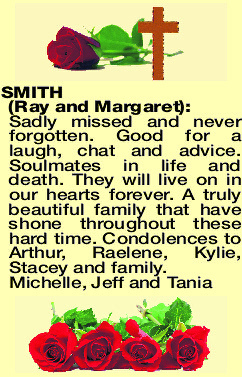 Condolences to Arthur, Raelene, Kylie, Stacey and family.